← Beef and Shanked: how about a little blood with your boys? Juan of the Dead gives us a fresh take on the laugh-until-you-puke zombedy. 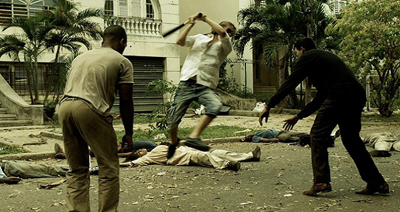 It focuses on a band of not-so-nice guys in Cuba who decide to cash in on the zombie apocalypse—by charging people to kill loved ones who have already turned. AWESOME. Juan of the Dead has a lot going for it. It’s really funny and perfectly paced, with plenty of action, likeable characters, great slapstick zombie humor, and great gore and zombie kills (wait until you see the mass “wire” killing). There are quite a few awesome zombie confrontations. There’s a balcony scene that rocked my zombie world, an underwater zombie scenario that blows away every other underwater zombie scenario, and a chain gang nightmare that destroyed years of prison fantasies for me. On the downside, the man candy count is low. There’s a lean, furry white dude with long hair who’s kind of hot, and there’s also a big, beautiful, black muscle hunk. Both are forced to strip at one point. Also, many scenes that could have been effectively frightening are watered down by a pretty cheesy musical score that keeps the film rooted in a comic tone rather than walking the line between fear and funny. And finally, if you’re a generally sensitive gay man (I’m not), you’ll probably be extremely offended by the handling of gay situations in this film. Lesbians are predictably lusted after by the men, and while there is a strong, feminine gay character who is generally treated equally by his peers, there are many derogatory gay remarks. The film takes a conflicting stance that is gay positive and insulting all at once, which may be based largely on general Cuban attitudes towards gays? I don’t know. 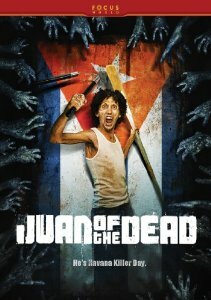 And finally, as someone who loathes history, social studies, and politics, I had to completely ignore the heavy emphasis on political themes in Juan of the Dead and simply enjoy the horror comedy of it all. I also kind of had to block out the hokey “dance number” between Juan and the gay dude. This entry was posted in Johnny You ARE Queer - Gay Thoughts, Movie Times & Television Schedules - Staying Entertained, Scared Silly - Horror Comedy, The Evil of the Thriller - Everything Horror and tagged horror comedy, Juan of the Dead, living dead, undead, zombedy, Zombies, zomcom. Bookmark the permalink.